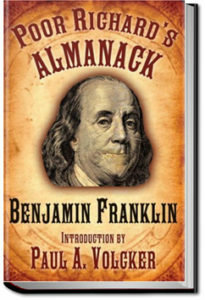 A brief biographical sketch of Franklin’s life, followed by a collection of 670 aphorisms, apothegms, or proverbs – short, pithy, instructive sayings – that were scattered throughout the pages of his Poor Richard’s Almanack over its 25 years of once-a-year publication (1732-1758). Many of these sayings are familiar to all . . . “a penny saved is a penny earned” . . . “a bird in the hand is worth two in the bush” . . . but there are many more for you to laugh at, ponder over and learn from! Most were not invented by him, but these little gems of wisdom Franklin gleaned from all over the world are what made his Almanack so wildly popular, and himself a wealthy man.